Hi everyone. I just realized it’s been a week since I posted anything. I have been cooking everyday, developing a couple of recipes as well. Unfortunately these recipes were made either in a hurry, eaten out of extreme hunger, or I had guests coming, so I forgot take photos. Oops. Next time. I have a thai flavored recipe coming up soon! I was cleaning out my freezer the other day and found not just one, but four packets of puff pastry. I couldn’t remember the last time I cooked with them, so clearly I had to use them up ASAP. Puff pastry is a perfect standby for a quick lunch or dinner. You can think of any number of toppings to go on top (savory or sweet), bake for 20 minutes, and voila! Who says cooking is annoying and time consuming? 2. Slice the fennel bulb very thinly. A mandolin slicer works best for this job, but if you don’t have one, use a sharp knife or potato peeler to shave off slices. 3. Thinly slice shallots. In a medium bowl, mix shallots and fennel slices with a good drizzle olive oil and lemon juice. Season lightly with salt and pepper. 4. 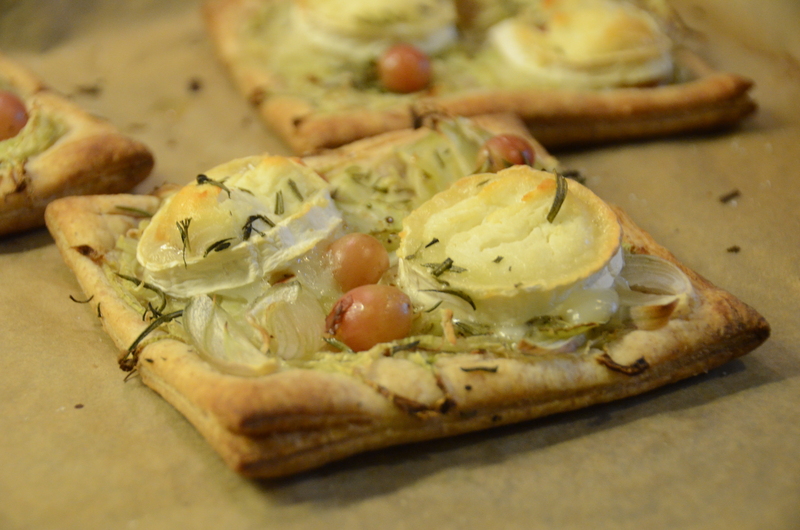 Evenly distribute the fennel-shallot mixture on the puff pastry, leaving 1-2cm of the edges unfilled. 5. 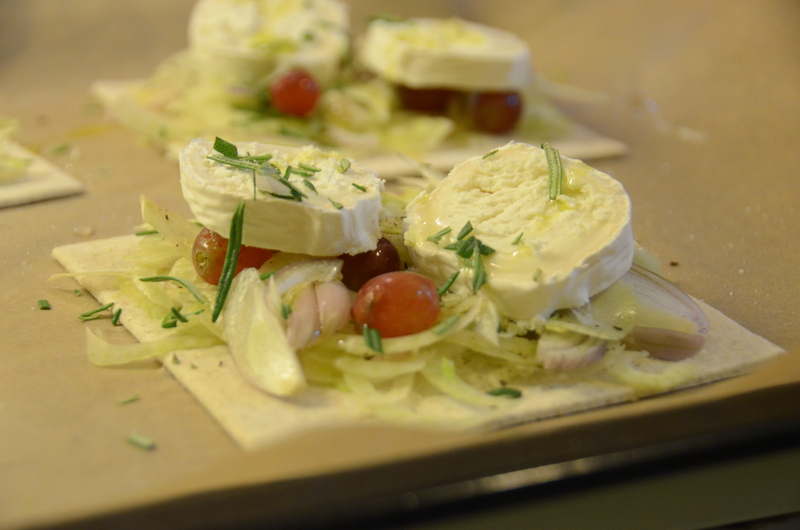 Top with slices of goats cheese, grapes, snippets of rosemary. Drizzle with some more olive oil. 6. Bake for 15-20 minutes until the puff pastry is golden. Check the bottom of the pastry and make sure it’s fully cooked. 7. Serve warm. Be careful when biting into grapes. They are very hot! I burnt my mouth eating these tarts straight out of the oven.